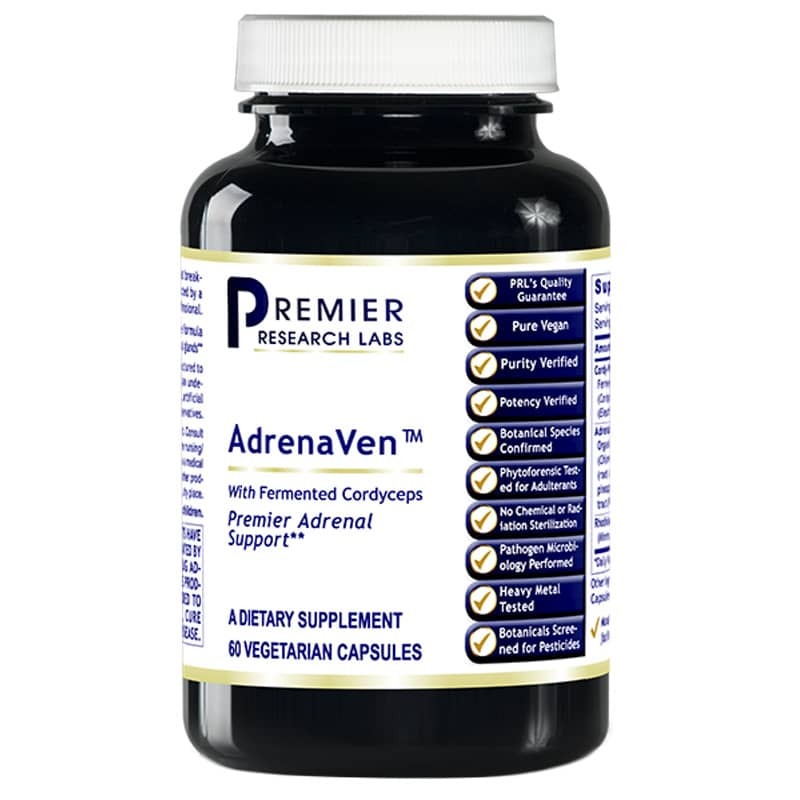 AdrenaVen from Premier Research Labs includes a synergistic blend of herbs, cordyceps, and nutrients to provide a full range of support to the adrenals and immune system. If you're looking for a premier-quality supplement that offers adrenal and immune support, check into Premier Research Labs' AdrenaVen. Order online today! Contains NO: excipients, artificial colors, artificial flavors or artificial preservatives. Pure Vegan. Adults: Take 2 capsules at breakfast or before 2 P.M. or as directed by a healthcare professional. I have been taking AdrenaVen supplement for almost 2 months now, taking 2 capsules daily but I have not felt any improvement nor difference in my stamina etc. Perhaps I might have to take 6 capsules per day like what suggested in the reviews? First adrenal supplement that does not also affect my ability to sleep at night. All others act like a slight stimulant at night, even when taken in the AM. AdrenaVen is a great product; have ordered more already! My natural doctor recommended AdrenaVan. After 3 weeks, doctor added Adaptogen R3 as a companion. The best products for the best prices, the best service staff, and always free shipping! You have everything I need and I get it promptly with Free shipping. It doesn't get much better than that! I've taken as many as 15 in one day. Works amazing! Obviously can get expensive. Just taking 2 or 3 does very little for me. Originally prescribed by our doctor for one year, we're still taking it and can tell a difference in energy levels and digestive processes. I have taken this for years as a supplement to my Armour Thyroid. I can tell a difference when I am out of it. I love and trust this company's products. My MD ND suggested I take more than I do but due to expense, I only take 2/day.